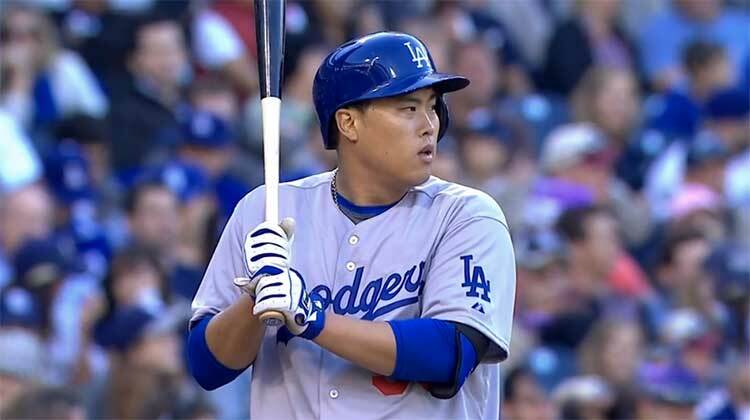 Hey, Hyun-jin Ryu: I think this is going to work out just fine. And really, when this game got started, I wasn’t sure this was going to be Ryu’s night. Missing badly outside to righty hitters, Ryu allowed three of the first four Padres to reach, walking Everth Cabrera and Jedd Gyorko around a Chase Headley strikeout and Chris Denorfia single. He survived by inducing a Yonder Alonso 1-2-3 double play, but then allowed the first two hitters of the second to reach, and it seemed like this might be a long evening. But then: nothing. Ryu got the next three in a row to escape the second, then sailed through the third, fourth, fifth, and sixth innings — setting down 16 in a row, including the first batter of the seventh — and even when the streak was snapped by Tommy Medica‘s walk, Will Venable‘s double play immediately ended the the threat. In seven innings, Ryu struck out seven; in 12 innings this year, he’s struck out 12 and allowed not a single run. This is, as I saw someone joke on Twitter, potentially the greatest March in baseball history. Oh, I know the Dodgers lost. Don’t think we won’t get to that. We will. But before we start talking about the eighth inning, I wanted to at least focus on how good Ryu was in front of a record-setting Petco Park crowd, because over the course of the long season, his production is worth way more than the one game that was dropped today. Obviously, there’s more to the story than that, because then Brian Wilson had to immediately blow it by allowing Seth Smith to destroy a baseball on Wilson’s third pitch of the 8th inning. But it’s okay: it got worse, when Wilson walked Yasmani Grandal, then couldn’t handle a Cabrera bunt, then allowed Grandal to steal the first base of his professional career — and while that’s partially on Juan Uribe, I like to think that the Dodgers just couldn’t see Grandal in his camouflage uniform — and then Denorfia drove in two with a single. After Adrian Gonzalez booted a ball of his own, off the bat of Headley, that was it for Wilson, having retired zero batters. Chris Perez entered to get Jedd Gyorko, and Paco Rodriguez, thankfully, struck out Alonso and Medica to get out of it. Kenley Jansen, as far as I know, never warmed. I’d like, if we could, to not kill Don Mattingly for lifting Ryu after 88 pitches, which I’m already seeing some of on Twitter. Remember that 48 hours ago, we didn’t even know if Ryu was pitching this game, thanks to that toe injury. Remember that it’s March 30. Remember that he’s starting three of the first six games. Remember that Clayton Kershaw is on the DL. If there was ever a time not to push your starter, this was it. Wilson gets hung with the L, which I mention only because it was absolutely deserved, but of course, I’d be remiss to not mention the disappearance of the Dodger offense, which is another way of saying “Andrew Cashner is really, really good.” Only Carl Crawford (who drove in Dee Gordon for the only run in the fifth), A.J. Ellis (two), and Juan Uribe had hits; only Yasiel Puig, Ellis, and Gordon walked, and yes, that does mean that Ellis reached three times. But what that means is that the top five — Crawford, Puig, Hanley Ramirez, Gonzalez, and Andre Ethier — combined to go 1-19 with a walk. Crawford struck out three times. Gordon couldn’t get the job done with two on in the second. Ryu’s fifth-inning bunt attempt with two on ended with Ellis thrown out at third. Ramirez grounded out to end the fifth with the bases loaded. There was a whole Gordon/Ryu buntastrophe in the seventh that may or may not have been Mattingly’s fault. It doesn’t really seem like it because this was the first game most of us watched — I know I didn’t really give the Australia games the usual amount of attention — but the Dodgers still have two wins in their first three games. While the fact that they’re off tomorrow (Zack Greinke and Ian Kennedy resume the series on Tuesday) might not sit well after tonight’s loss, I’m frankly looking forward to the idea of 12 solid hours of televised baseball without needing to worry about the score.